Vitiligo is a skin disease in which the partial or complete loss of melanocytes from patches of the skin produces irregular white spots and that affects generally any part of the body, this includ¬es premature graying of hair. Vitiligo can also affect the mucous membranes (such as the tissues that line inside of the mouth and nose). Personally and cosmetically, it can affect lives of the sufferer especially in that society; were given importance to a color of skin; particularly amongst the brown and dark skin people. In all over the world, this disease has been observed for thousands of years. About 2% of the world population is affected by Vitiligo. It is very common disease around 1.43% of people from the entire population of the world is involved in Vitiligo. It does not include tribal, sexual or regional differences among the population. 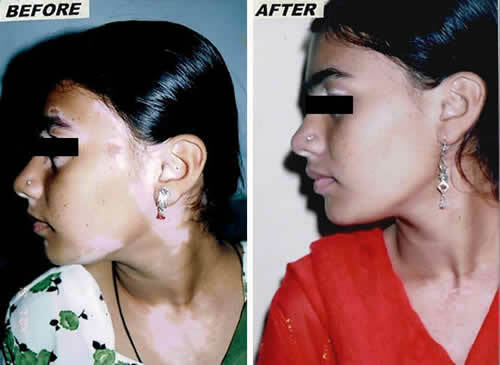 Some of the reports suggest that occurrence of Vitiligo in India, Egypt and Japan is higher. It ranges from 1.25% to 6% of the total population. 25th June is celebrated as a world Vitiligo day. In this type of Vitiligo, there will be only one part which will suffer from Vitiligo. No other body parts will take on depigmentation. In this type of Vitiligo white spots will appear in segments. These segments can be of different shapes and sizes, apart from of its place that which part of a body is depigmented. 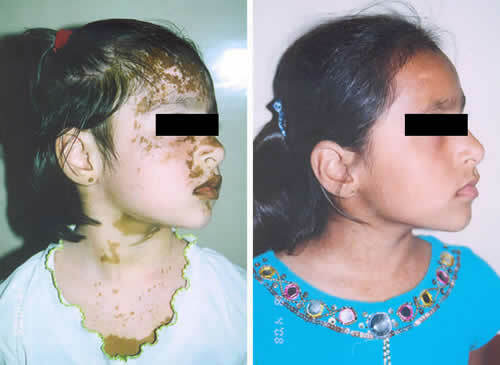 This type of Vitiligo only disturbs mucous membrane. In this kind of Vitiligo different part of the body are affected like arm, hand, feet, face etc. 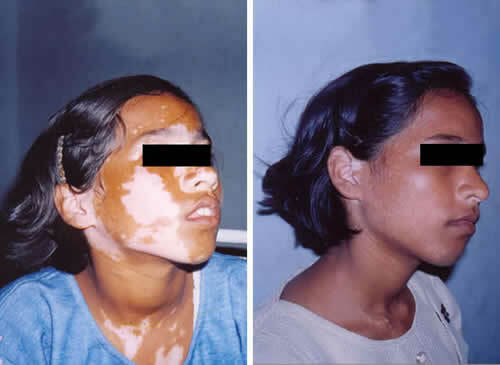 In this type of Vitiligo, white spots are distributed generally on all parts of a body. If more than one kind of Vitiligo occurs at once then it will be called mixed Vitiligo. 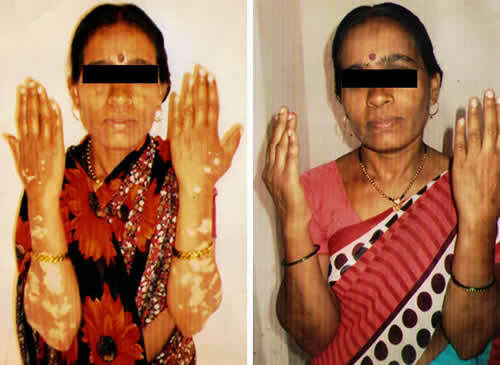 In this type of Vitiligo, all parts of body affected by white spots. 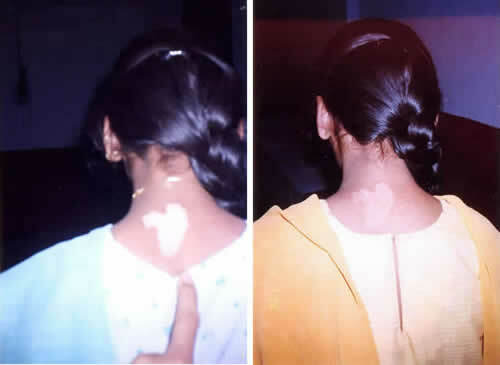 Depigmentation started in every part of body. At times Vitiligo occurs when a person is working with certain chemicals and these chemicals badly affect pigments and depigmentation started, this type of Vitiligo known as occupational Vitiligo. 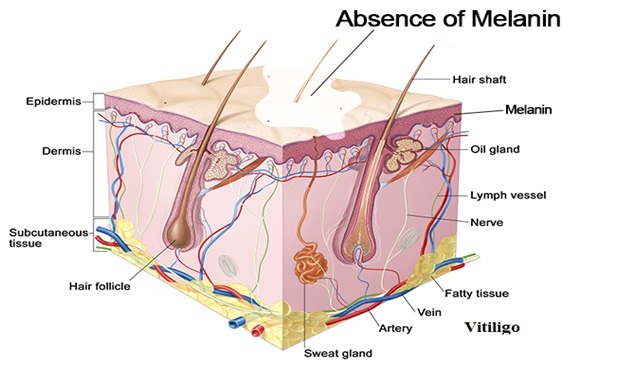 An autoimmune disorder - the patient's immune system becomes more active and destroys the melanocytes in the skin. The common appearance of Vitiligo is a milky white depigmented spots. It can vary from a single white spot to multiple spots. The shape also variable. 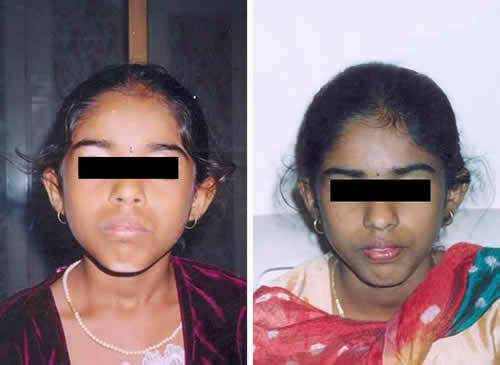 In some of the cases generalized de-pigmentation observed all over the body. It has a tendency to start from a single spot and progressively grow in size and in number. It may present with a single or several spots on abdomen or limbs or back and then spreading to other parts of the body. 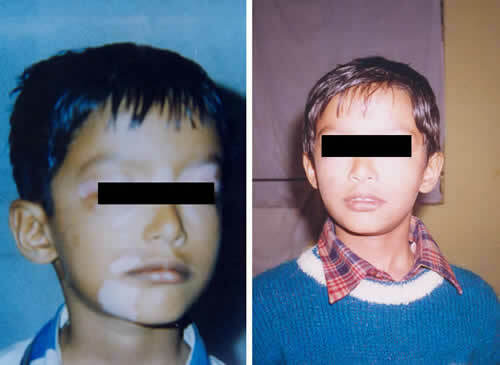 Some cases showing affection of the muco-cutaneous junctions such as corners of the mouth, finger-tips, around eyes, private parts. The spread of the disorder is generally slow and progressive. Symmetrical appearance on both the sides of the body (on the legs, hands, etc.) is common. Rarely does it find that Vitiligo is spreading all over the body. 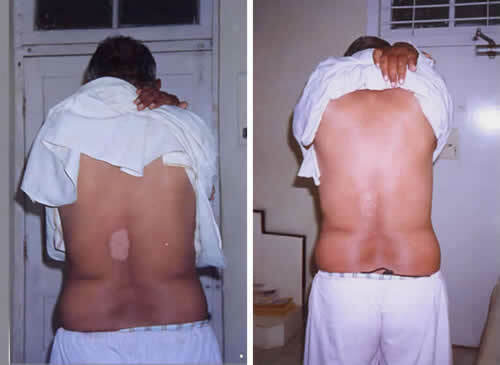 Homeopathy offers confirmed treatment for Vitiligo which does not have extensive spread of spots. Early and milder cases can be treated with tremendous success, moderate and spreading cases can be expect partial color formation with good control, while rapidly spreading cases could be controlled considerably. It may be noted that good control over the spread is also considered a success in extensive cases. Homeopathy treats the person as a whole. It means that homeopathic treatment concentrates on the patient as a person, as well as his pathological condition. However the core understanding of homeopathy reveals that the actual cause is internal and hence homeopathy targets to treat the problem from the root. The homeopathic medicines for Vitiligo are chosen after a full examination of individual and case-analysis, which includes the medical history of the patient, physical and mental constitution etc. A transmittable affinity (susceptibility /predisposition) is often taken into report for the treatment of chronic conditions. Helps patients body to cope up with stress and emotional force. A range of emotions experienced by the Vitiligo affected individuals include rejection, shock, annoyance, loneliness, worry, humiliation, panic, embarrassment, depression and guilt. 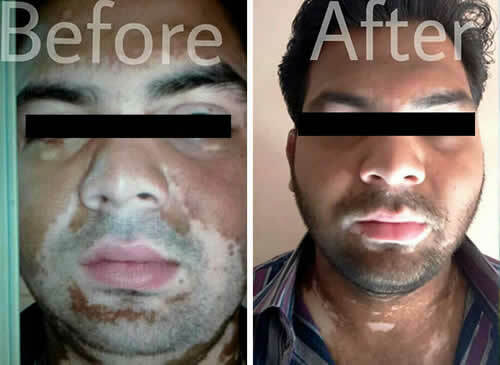 A person’s self-confidence is strictly affected by the Vitiligo and patient becomes enormously self conscious, particularly in a group which gives much importance to the physical look. The person should always maintain a positive approach towards life. Humor is a very simple way to achieve this. One must try to improve one’s confidence by understanding his own character. Vitiligo is much less severe than a cold or other infection. It is important to understand the ailment carefully. Support from the family and friends are essential in living with the disease. It will be excellent if they can join in a support group which supports this disease. Conversation with similar people makes them realize that there are other people too in the clash of Vitiligo. The more they connecting with others, the better they will be able to achieve positive change. Finding a right doctor is very important. The physician should be able to recommend you proper medication, according to the individual’s physical and mental condition. Talk openly to your doctor. The patient must take care of their skin. Use cosmetics to mask depigmented area. Make-ups or self-tanning lotions can help in matching the color of the skin. This is useful in case of limited vitiligo. But it is advisable to get a word from the physician before starting anything new. Change the over cognizant attitude towards the child’s condition. Educate your child on how to respond to the questions regarding the disease. Primarily is by talking with the relatives not to converse about the disease with the child. No pessimistic discussions about Vitiligo should be carrying out in the child’s presence. Encourage the child to get engaged in games and other activities, and attending social events. Don’t say no to your child as of wearing garments which exposes some spots on the skin. Do not stare at a person with Vitiligo. Do not humiliate them. They are common people with just a different skin appearance. Do not ask them how, why, and when. Person affected with Vitiligo do not call for sympathy. Just understand them. Whole grains like oatmeal and whole wheat products are better than highly refined carbohydrates like pasta. Adequate hydration is a key component of healthy diet which should not be ignored. Avoid eating sour foods like pickles, yogurt. Neem is useful in any form. Mung dal is also good. Keep away from eating non-vegetarian foods like fish and red meats, as they may be highly antigenic and may deteriorate the autoimmune process. Also avoid eggs, milk, and dairy products. Drink water kept in a copper utensil overnight. This is known to have a stimulating effect on the melanocytes and thus helps in increasing production of melanin pigment.